Komline-Sanderson’s variable-speed Rotary Atomizers represent a dependable approach to atomization and spray drying. The compact, rugged, direct-drive, high-speed motor, utilizing only a few parts in one rotating assembly (no gear, pulley, gearbox or coupling), reduces the need for traditional mechanical maintenance. High quality, oil-mist lubricated precision bearings (ABEC-7), of ceramic-ball design, provide maximum reliability. 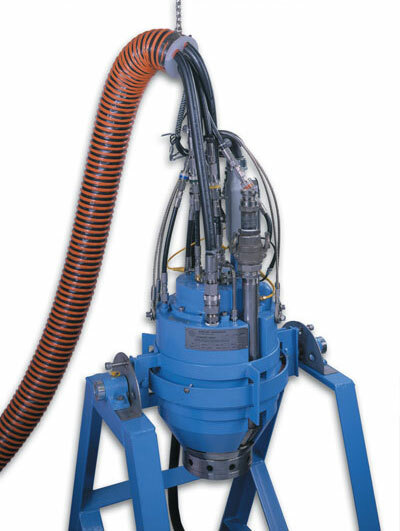 Our Rotary Atomizer units can handle any pumpable feed material, solution or slurry, covering a wide range of feed characteristics in terms of solids content, density, and viscosity. Process material can be fed to the atomizer by a low-pressure positive displacement pump, or even by gravity flow from a head tank. 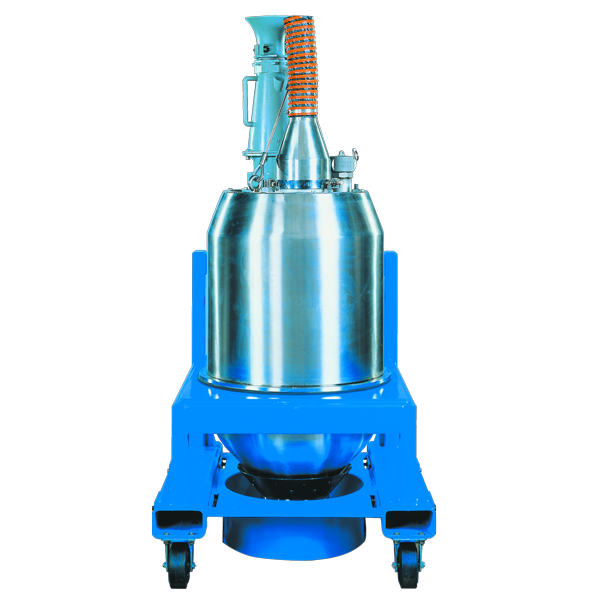 The atomizer converts the feed into a spray or atomized cloud of fine droplets, typically 30-50 microns in size, suitable for spray drying. All systems are provided with an atomizer control panel/lubrication stand, housed in a NEMA-4 (IP66 equiv.) enclosure, and designed for location adjacent to the operating atomizer. The panel permits control of the oil mist generation system for the lubrication of the atomizer bearings, and flow control for the cooling water to the atomizer stator. The panel also includes all start/stop controls and monitoring functions, including an optional PLC-based atomizer control and system monitoring capability. K-S Rotary Atomizers feature a variable frequency drive (VFD), using the state-of-the-art pulse width modulation principle for generating a high frequency power supply. The VFD is in a NEMA-1 (IP20) or NEMA-12 (IP55 equiv.) enclosure, intended for location in a remote electrical equipment room area. 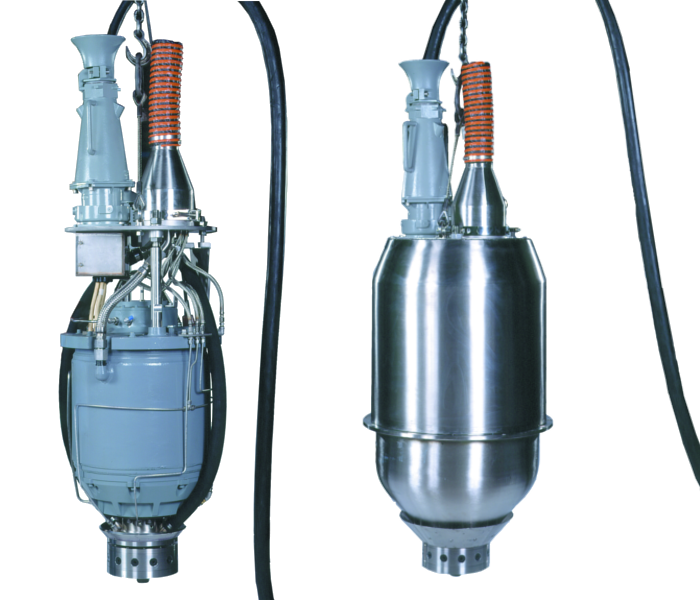 The atomizer assembly is designed to fit easily into a hot air plenum, providing intimate mixing between the atomized feed material and the hot drying air. 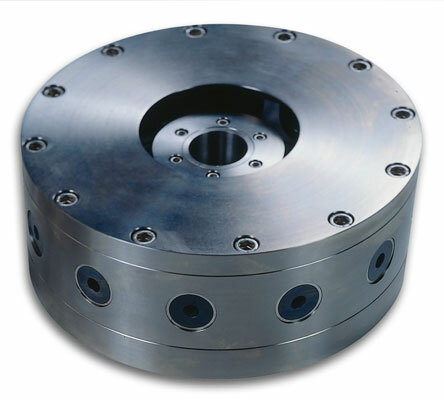 Unique “direct drive” atomizer unit mounts the atomizer wheel directly on rigid shaft of high speed motor, allowing the unit to operate below the first critical speed, thereby minimizing the risk of excessive vibration (operates below its first critical speed). Use of a variable frequency drive (VFD) allows easy adjustment of atomizer speed to optimize process performance and product characteristics. 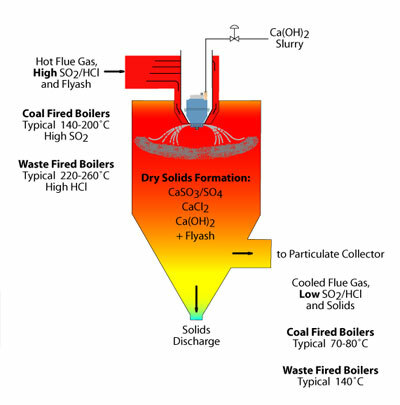 Atomizer design and material of construction make it suitable for use both in “traditional” chemical spray dryer plants and in corrosive flue gas spray absorption processes. 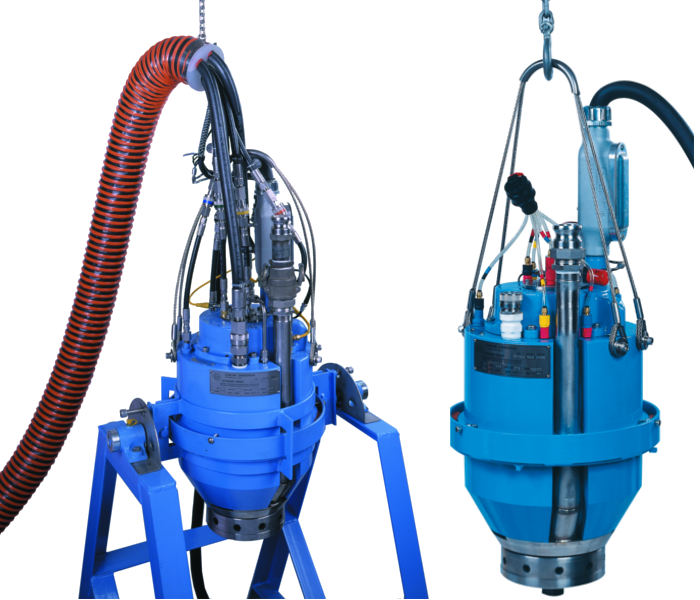 Compact size of units (compared to gearbox designs) allows for easier manual handling during removal, inspection, cleaning, reinstallation, etc. 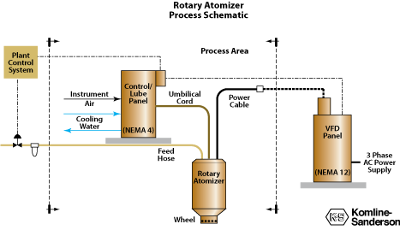 Option of multiple atomizer configuration for larger capacity plants (three atomizers per spray dryer) allows the removal of one unit for inspection/service without process interruptions. Local Atomizer Control Panel (included) provides for both local and remote control and monitoring functions. Titanium fabrication Abrasion-resistant design available by use of tungsten carbide (WC) or ceramic (SiC) wear elements. Is the VFD supplied unique to the K-S rotary atomizer? Yes, K-S has specified, evaluated, and tested commercially available VFD’s for the specific use with our technology, and will supply a VFD from a recognized and established supplier with a worldwide presence. Does the operating atomizer need regular inspection & maintenance? Yes, the operator should inspect the assembly for process impacts (slurry deposits, wear of wheel parts, etc.) every 2-4 weeks, typically as part of a preventive maintenance program; a thorough shop inspection and maintenance is recommended for each unit approximately once a year. Does the client always need to procure a spare atomizer assembly? Having at least one(1) spare unit is recommended for facilities with an atomizer in continuous, around-the clock operation, in order to provide redundancy during periods of inspection & maintenance. Is a redundant lubrication and cooling system required? No, the current K-S system has been optimized with special consideration towards ease-of-operation and adequate redundancy and monitoring capabilities to provide for very reliable operation. The system contains miscellaneous filters for air, oil, etc. that require replacement on a scheduled basis. Should the client inventory spare parts? K-S will provide a complete list of spare parts that may be inventoried. The exact scope of parts that should be inventoried primarily depends on whether the client elects to perform atomizer maintenance on-site, or whether the client chooses to have it done by other parties. What mechanical maintenance is required? Primarily the upper and lower high-speed bearing of the atomizer assembly should be replaced every year. Also, the wear parts of the wheel exposed to feed slurry (nozzle inserts, bottom wear plate, and hub cone) must typically be replaced on a regular basis, depending on the abrasiveness of the client’s feed material. How does K-S provide atomizer maintenance and service? K-S’s atomizer service center in Peapack, New Jersey, performs atomizer and wheel service for K-S clients, based on our experienced technical staff and inventory of spare parts. Alternatively, K-S offers to train the client’s technicians in the proper disassembly, parts replacement, and re-assembly of our atomizers and wheels. We also offer a full range of spare parts.